Georgia Sapounas » Olympic I.D. Managed the launch of the Olympic I.D, a turning point in transforming the Canadian Olympic Team brand into a connective network for fans, sponsors and sports organizations across the country. Data literacy is on the rise amongst consumers, and many are willing to exchange data for value. This provided a game-changing opportunity for our brand to build an owned database of fans, substantially increasing opt-ins to our mailing list and integrating our fans deeper into partner and licensing revenue opportunities. Olympic I.D. (Unique Social Registration) is the platform that allows fans to connect to our brand across all digital channels. By creating a single account for each fan, we make brand, content and experience engagement seamless. 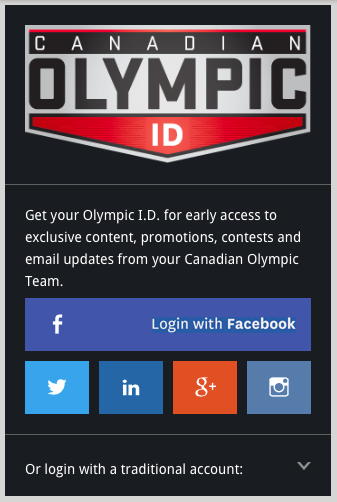 By leveraging social login, the Canadian Olympic Committee generates enhanced online and social experiences through personalized content and fan-segmented relevant marketing campaigns. We created a seamless user experience and have increased engagement which encourages long-term loyalty. Each time a user chooses to log in to the Canadian Olympic Team site with a social identity, we immediately collect a rich set of profile data in a transparent, permission-based manner. We provide huge value to our fans in exchange for their data. This database of Canadian Olympic Team supporters will lead to truly defining our core audience, customized fan experiences, relevant content, understanding what value propositions are working and a deeper understanding and integration of our fans in our brand.